Are you looking for affordable and dependable roustabout services for your oilfield operation? Finding the right business to handle your welding, excavation, and general oilfield construction work can be difficult. You want an experienced group of professionals who will get the job done on time with minimal delays. You also need to take care of your bottom line. Meador Construction can handle all of your pipeline construction, welding, and oilfield services, saving you time and money. 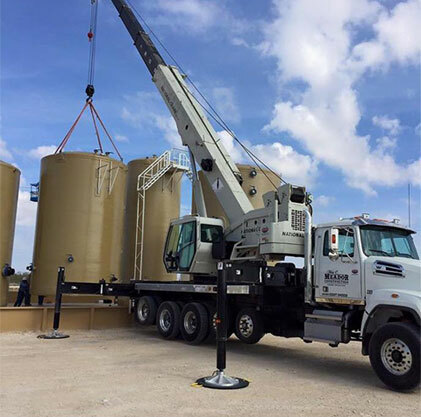 For more than 25 years, our locally owned and operated oilfield service business has delivered high-quality results throughout San Angelo, TX. We specialize in pipeline maintenance and construction as well as gas compressor installation. Our key to success is working with successful companies and developing a strong, mutually beneficial relationship. With the most advanced welding, backhoe, and pumping equipment in the industry, we’ll provide reliable oilfield services. Whether you need pipeline construction for a new site or pipeline maintenance for existing equipment that needs care, our certified, full-time welders will get the job done. Meador Construction offers prefabrication and on-site fabrication for your convenience. When you have problems with pressure piping or your oilfield equipment and structures, our mobile team of welders can arrive promptly and deliver efficient and effective results. We stay safe when providing oil pipeline services by adhering to all codes and regulations. Our excellent track record for safety ensures that you get the results you need. Call Meador Construction today for all of your oilfield service needs! Copyright © 2016 | Meador Construction | All Rights Reserved.